Barolo is one of Italy’s greatest wines and is considered to deliver the highest and most powerful expression of the Nebbiolo grape. Although its origin is shrouded in mystery, its rise to stardom is not. Supposedly, the red wines of this area were once deliberately sweet. They were first finished dry around the mid-1800s, thanks to the wishes of Giulia Falletti, the last Marquise of Barolo, and the efforts of Camillo Benso, Count of Cavour, with the support of the French enologist, Oudart. Camillo Benso, Count of Cavour, was one of the leading figures of the Italian unification during the 19th century. In 1861, he became Italy’s first Prime Minister. In truth, although some wines may have contained residual sugar prior to the 1850s, this was most likely due to a casual combination of several factors: the late-ripening nature of Nebbiolo, its high sugar levels at harvest and incomplete fermentations due to the early onset of winter cold. Modern theories credit Camillo Benso, Count of Cavour and, in particular, his Italian enologist, Paolo Francesco Staglieno, a former military general, for creating a dry-styled Barolo in the 1830s-1840s by avoiding stuck fermentations by using closed vats and improving cellar hygiene. But regardless as to how Barolo evolved into its current dry style, it did become famous due to the efforts of the Marquise of Barolo, Giulia Falletti. The Marquise produced dry red wines at her Barolo estate and she introduced these wines to the aristocratic circles of Torino. Thanks to the Marquise, the wines attracted the interest and attention of the Savoyard royal family who acquired winemaking estates in the Barolo area themselves (notably in Verduno and Serralunga d’Alba, where the once royal estate Fontanafredda is still active today). The wines were so prized that they became liquid ambassadors for the House of Savoy among the royal courts of Europe and laid the foundation for its longstanding international recognition as the re dei vini e vino dei re (king of wines and wine of kings). The Barolo DOCG is situated in the northwestern part of Langhe, on the right bank of the Tanaro River where the river makes a 90 degree turn east. Alba lies just a few miles to the northeast of Barolo, separating it from Barbaresco. The appellation is approximately 7 mi/11 km long and 5 mi/8 km wide at its widest point. To make up for its small size, it is rather densely planted—with more than 4,447 ac/1,800 ha under vine. 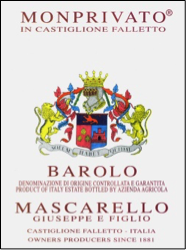 Barolo must be produced from 100% Nebbiolo and only from the strictly delimited hills surrounding 11 towns. By law, the entire communes of Barolo, Castiglione Falletto and Serralunga d’Alba are entitled to make Barolo, whereas more restricted areas surrounding the communes of Monforte d’Alba, La Morra, Novello, Verduno, Grinzane Cavour, Diano d’Alba, Cherasco and Roddi are also included within the DOCG. In actuality, however, almost 90% of the appellation surrounds five villages: La Morra, Barolo, Castiglione Falletto, Monforte d’Alba and Serralunga d’Alba. These five towns are the most well-known and are considered the most significant. In Barolo, Barbaresco, Langhe and Roero, the best vineyards sites are often called Bricco or Sörì. Bricco (or Bric) is a superior site on the higher part of the hill. Sörì is a well-exposed, sunny site. According to the disciplinare, vineyards in Barolo must lie at an elevation between 550-1,800 ft/170-540 m, but in practice, most Nebbiolo tends to be planted mid-slope, at the lower end of the permitted altitude range in order to achieve full ripeness. The soils of Barolo (and Langhe in general) are the result of two different geological formations: the older Helvetian/Serravallian and the younger Tortonian. The soils of these formations have different characteristics, affecting the profile of the wines. For the most part, the soils of Barolo belong to the Tortonian formation. The Tortonian soil covers roughly the western half of Barolo and small parts of the eastern portion. This soil is composed of calcareous marls that are more fertile and compact than Helvetian. The vineyards of La Morra and Barolo are found on this soil. The wines produced in this area are likely to be more perfumed, elegant, fruitier and softer—maturing relatively more rapidly. The Helvetian/Serravallian soil is mainly composed of sandstone and sand. It is poorer, less compact and less fertile than Tortonian. 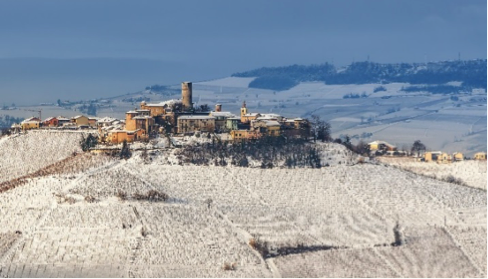 The wines of Monforte d’Alba, Serralunga d’Alba and part of Castiglione Falletto show more power and depth and are fuller in body, more robust and structured. They are notably longer-lived, requiring more time in the bottle. Traditionally, the great majority of Barolo was produced by merchants (commercianti) and was often made by blending wines from different vineyards and/or different communes. This practice had the advantage of maintaining a consistent style vintage after vintage. However, it also concealed the individuality of each vineyard site. The situation changed considerably in the 1960s and 1970s, when estate-bottling became more widespread. Consequently, single-vineyards bottlings appeared more and more often, providing increased evidence that different vineyards or zones produced wines with unique profiles, showing nuances that were specific to those sites. Barolo’s superior sites (crus) had already been acknowledged and recognized among growers and wine merchants alike since the 19th century—as grapes from those sites normally commanded higher prices. According to local wisdom, the best sites were known as the places where the snow melted first. 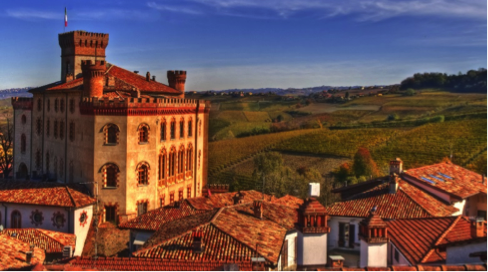 To make it official, the Barolo Consorzio, in cooperation with the province of Cuneo and the various Barolo villages, undertook the challenging task of regulating the use of vineyard and zonal names historically known to produce wines of distinction. After several years of hard work, the disciplinare added the menzioni geografiche aggiuntive or MGA (additional geographic designations), which serves as a list of delimited vineyard areas allowed to appear on the Barolo label. However, it is important to note that these additional designations do not represent a quality pyramid among the different MGAs—it is not a classification system. In total, there are 181 geographical designations, of which 11 are communal. Wines may be labeled with one of the additional geographic designations provided the fruit comes from the stated designation. Among the most well-known sites are Bussia, Cannubi, Cerequio, Rocche dell’Annunziata, Brunate, Monprivato, Ginestra, Francia, Sarmassa, Vigna Rionda. Today, Barolo (and Barbaresco) are probably the most carefully vineyard-charted appellations of Italy. Until the 1970s, Barolo was made in a unique and traditional style. The wines were given long macerations (up to one to two months) and extended ageing (commonly four or more years) in large, neutral old Slavonian oak or chestnut casks (botti). The long maturation in wood was necessary to soften the harsh tannins extracted through the prolonged macerations. But these extended macerations also increased the risk of losing the delicate varietal character of Nebbiolo. The resulting wines were austere and tannic when young and were approachable only after considerable additional bottle ageing (sometimes decades). 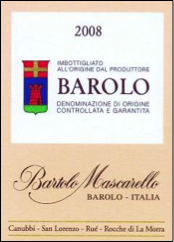 Revamped winemaking practices created more “modern” Barolos in the 1980s leaning towards an obvious international style. The wines were fruit-driven and approachable upon release. They boasted softer tannins, more concentration and noticeably more oak. Today, the difference between “traditionalists” and “modernists” is considerably less marked than before. Although there are exceptions, many producers are now making a style that falls between these two poles with a more subtle approach and more judicious use of oak. The aim is to enhance the character of Nebbiolo, while at the same time, manage its tannic and acidic nature by using both traditional and modern techniques. 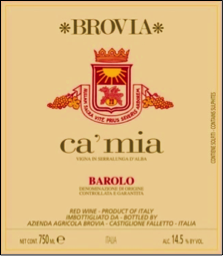 Barolo is usually never deep in color; it ranges from light ruby to garnet and acquires a brick-orange hue over time. The wines boast intense and complex aromas of flowers (rose and violet), fresh red berries, cherries, tar and earth. All of this evolves over time into more refined aromas of dried fruit, dried flowers, spices (nutmeg, cinnamon) and mint, coupled with layers of leather, tobacco, gamey-meaty notes, licorice and white truffles. The palate shows concentration, dense texture, full body and Nebbiolo’s notorious acid-tannin core. The wines usually need time in bottle to smooth, soften and reach perfect balance. Barolo is very long-lasting and although some examples can be enjoyed after a few years in bottle, most benefit enormously from extended bottle age—developing great tertiary and ethereal complexity. Barolo must be aged for a minimum of 38 months of which at least 18 months must be spent in oak. The riserva must be aged for 62 months with the same minimum period of oak maturation. 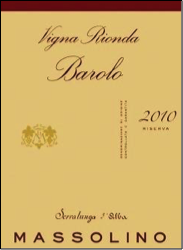 Barolo Chinato is a rare aromatized and fortified wine that is a local specialty of the Barolo area. 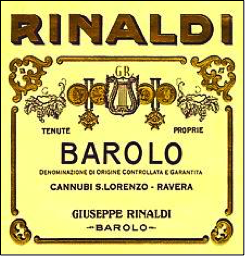 Quinine, aromatic herbs, spices are added to a base wine made entirely of Barolo. Barolo Chinato is usually drunk as a digestif or paired with dark chocolate. Since it can only be produced using Barolo wine, its production falls within the Barolo DOCG appellation.